A decision that had been weighing on A.J. Ryan’s shoulders for weeks came down to a matter of minutes but, when it was all said and done, Ryan committed to the school that was always at the top of his list. On Tuesday afternoon Ryan announced his commitment to Yale University after choosing between the Bulldogs, Princeton, and Colgate. 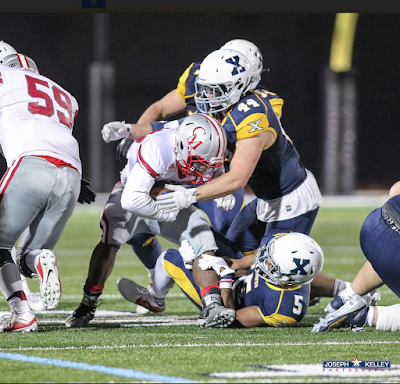 For months Ryan, who was named the Suite Sports Defensive Player of the Year following the 2016 season, was committed to Brown University, but de-committed and reopened his recruitment in the fall. Discussions with Navy, Colgate, Yale, and Princeton occurred for weeks, and finally this last weekend the two-time state champion visited Colgate and came away impressed. Yet Ryan’s decision was complicated when the Colgate coaches told him he would likely be playing a different position. On Monday night, Ryan’s phone rang; it was the phone call he had been waiting for. On the other end of the line was Yale head coach Tony Reno, who told Ryan that the Bulldogs were committed to making Ryan a member of their program. “I got a call form Yale (Monday night) and they offered me a spot, so my dad and I decided to take a trip down on Tuesday to walk around and get a feel for the campus,” said Ryan. Ryan’s mind seemed all but made up, but sure enough one more recruiting wrinkle was thrown his way. While driving down to Yale to confirm that he wanted to be a Bulldog, his phone rang again. This time the call came from Princeton, a school Ryan had become enamored with. Within seconds, Ryan faced the toughest decision of his life, and with Yale giving him a Tuesday night deadline to either accept or reject their offer, time for thinking was at a premium. Ryan hung up the phone with Princeton and stepped out of the car onto Yale’s campus. Immediately, Ryan made up his mind: He was going to be a Bulldog. Ryan heads to Yale as a two-sport varsity athlete (baseball), a two-time Catholic Conference All-Star, and a two time-state champion. He joins a Yale team that is coming off a disappointing 3-7 season, but did finish strong with the program’s first win over hated rival Harvard in a decade.